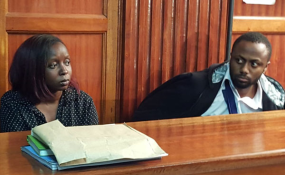 Nairobi — A mental assessment conducted on Citizen TV Journalist Jacque Maribe has shown that she is fit to stand trial in the murder of Monica Kimani in her Kilimani apartment. According to her lawyer Katwa Kigen, the assessment was done on Thursday following a court order on Tuesday. He stated that following this, Maribe will now take plea together with her co-accused Joseph Irungu alias Jowie who is the main suspect. "Yes, she is well as we all expected. We all saw her the last time we were in court and now we will move forward with the plea taking on Monday then apply for bail," he stated. "Thereafter, we will seek documents from the prosecution so that we can begin our preparations." Justice Jessie Lesiit ordered she be remanded at Lang'ata Women's Prison while Jowie was detained at Industrial Area Remand Prison until Monday when they will be produced in court to face charges. Jowie's lawyer Cliff Ombetta complained that Jowie has never received medical treatment for a bullet wound sustained during an attempted suicide, despite orders issued by a Kiambu court when he was first arraigned two weeks ago. The two were arraigned in court Tuesday morning, following approval by the Director of Public Prosecutions (DPP) Noordin Haji who was satisfied with the evidence gathered by the Directorate of Criminal Investigations to prosecute the couple.